The most expensive UPK90 will succeed last year’s UP70 and is meant for consumers with Dolby Vision enabled TVs such as LG’s own high-end OLED or LCD models. 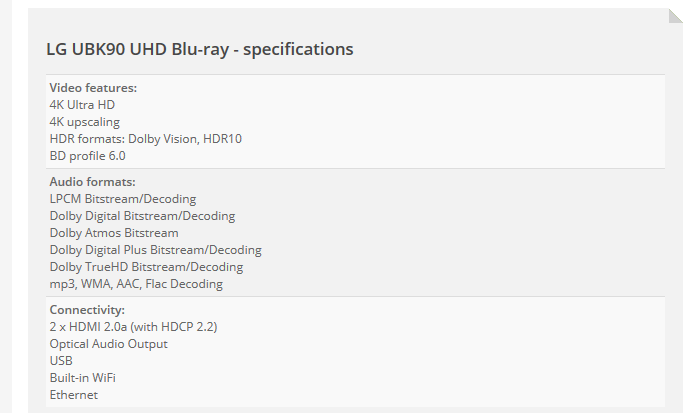 Naturally, both players adhere to the UHD Blu-ray specification, meaning that they will support 4K resolution, HDR10, and object-based audio formats such as Dolby Atmos and DTS:X. Besides Dolby Vision support, UBK90 offers two HDMI outputs (1 for video, 1 for audio) and built-in WiFi. UBK80 has only one HDMI port and an Ethernet port.